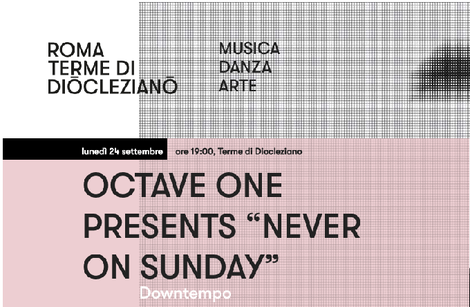 From the minds of Octave One comes their Never On Sunday live show. Detroit techno producers Lenny and Lawrence Burden venture away from their world of the pounding dancefloor and into a universe of switched up beats and tempos with their electronic band Never On Sunday. First debuting in 1991 on Carl Craig’s label Retroactive with the track ‘The Journey’, the Burden brothers developed the sound of N.O.S. with slower deeper grooves and experimental beats and vocals. With the success of this release, they produced N.O.S’s debut EP ‘Day By Day’ in 1992 for their own 430 West Records. Limited to 300 signed white labels, the record apparently quickly gained cult status and became a much sought after release by many vinyl enthusiasts. Abruptly stopping Never On Sunday’s production in 1992, Lenny and Lawrence continued to record under their Octave One moniker, concentrating mainly on the 4/4 dancefloor for several decades. 2018 brings the brothers back to a world that they missed greatly with a special performance in Rome on 24 Sept at Terme di Diocleziano with their first ever Never On Sunday live show. Incorporating their love for visual art interaction, urban beats, and experimental synthesis, the concert experience will bring all their worlds together. To make the occasion special, the brothers have returned to the studio with a new vocalists, Karina Mia, composing new material for the concert as well as recording a new EP for 2019 release.